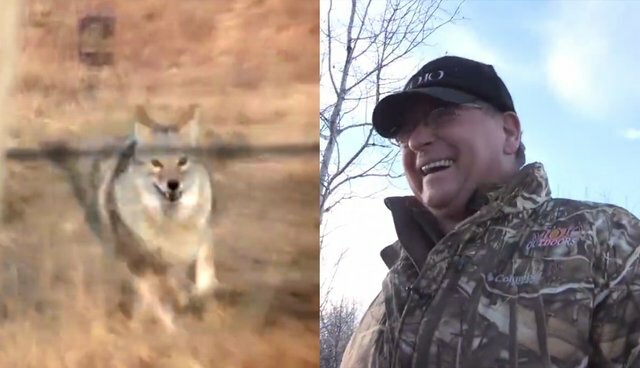 One of the last sounds this coyote ever heard was the gleeful chuckles of the men about to shoot him. During filming of the hunting show, Mojo TV, the unfortunate animal was selected as the target of host Rob Reynold's deadly aim - but things suddenly took a surprising twist. As Reynold leveled his gun and prepared to shoot, the frightened animal decided to charge, evading a bullet before knocking the hunter over with his body. "He ran over me!" said Reynold in disbelief to his colleague. "I kicked him on the way by." The two men then enjoyed a hearty laugh. Sadly, the coyote's bold move failed to secure his escape - or, at the very least, inspire sympathy from the men who were clearly taking so much pleasure in his panic. "We killed the coyote with shotgun about 60 yards after he ran over Rob." Reynold and other hunters might argue that wildlife conservation is at the heart of their bloody pastime - but should any creature lose his life to the sound of laughter?